INDUSTRY.co.id - Kulonprogo- On various occasions Minister of Agriculture, Andi Amran Sulaiman stressed that the availability of various chili and shallot must be safe and stable ahead of Ramadan 1439 H.
On this occasion, Upsus Chilli and Red Onion Team of the Ministry of Agriculture through the Directorate General of Hortikuktura directly supervise the cultivation in the field and harvest the chilli pepper in Bugel Village, Panjatan Subdistrict, Kulon Progo Regency Yogyakarta is the location of 350 hectares of curly chili harvest. This harvest was attended by members of the House of Representatives Commission IV, Titik Soeharto, Director of Vegetables and Medicinal Plants, Prihasto, Vice Regent Kulon Progo, Sutejo, Chairman of Parliament Kulon Progo, and elements of Muspida and farmers of various chili Kulon Progo. Director of Vegetables and Medicinal Plants, Directorate General of Horticulture, Ministry of Agriculture, Prihasto appreciated the cultivation of chillies by farmers in Kulonprogo. Its productivity reaches 15 to 17 tons per hectare. Productivity is very high compared to the national average production of only 10 tons per hectare. "In the future that productivity is maintained to apply the concept of environmentally friendly," he said last weekend. Prihasto, who is familiarly called Anto, said that the chili land in Kulonprogo is a stretch of sandy land spread wide into a pepper area with adequate irrigation. Namely pantek wells with hose irrigation systems and the provision of manure 30 to 40 tons per hectare makes the planting very fertile. "The result is an average productivity level of 15 to 17 tons per hectare. This is really amazing, "said Anto. According to Bambang Tri Budi Harsono, Head of Agriculture and Food Security, Kulonprogo, chili commodity is one of the mainstay commodities in Kulon Progo Regency. With an area of ​​1,939 hectares planted in 2017, and production of 20,184 tons. In 2018 the target of planting area of ​​2,050 hectares with production of 18,543 Ton. "With the potential of the region owned, then Kulon Progo has a strategic role that is to buffer the area of ​​Yogyakarta and at the same time to support Jabodetabek area, especially vegetable commodities of Chili," he said. On this occasion, Point Soeharto, appreciated the performance of the Ministry especially in maintaining the availability and production of chillies with plant management management system. This is reflected in the abundance of pepper production at present, as well as the readiness of the field crops to meet the needs of Ramadan and Idul Fitri 1439 H.
"The chilli farmers in Bugel Panjatan It can earn around Rp. 125 million / hectare with an average production of 10 tons / haktare at a price of Rp. 20.000 / kg, This is amazing, "he said. The hope, Titik pointed out, we urge the Government to Kulon Progo become a pilot and an example to be replicated by other regions into chili centers that integrated production and marketing. "It is also replicated because it has optimized the sand land with well water system wells and shallow wells," he hoped. 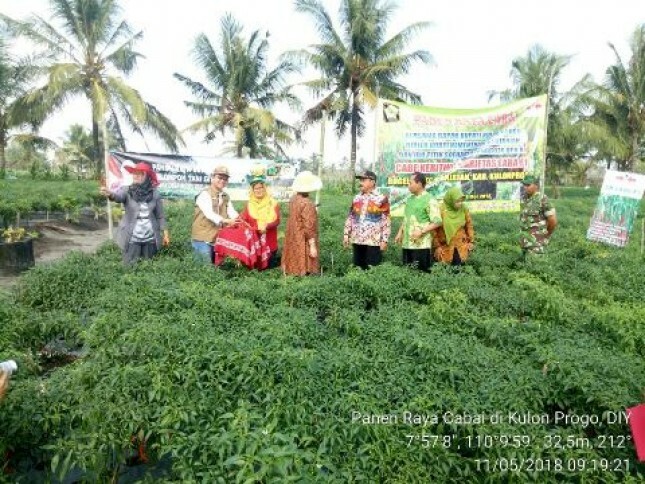 Meanwhile, according to the chairman of Farmers Group Ganik Pranaji, Sukarman as well as a champion chili Kulon Progo regency said the main chili center in Kulon Progo district spread in several districts. It is with the farmer groups built on the management of planting strictly, so that our expectations are always there in every month so that the supply can be maintained throughout the year. "Based on our ponderun in the field that it is estimated production of curly pepper May mei 45 tons with an average production of 8-10 tons / day. So far, the market objectives of the farmers' groups are mostly to enter the markets of Kramat Teak, Palembang and Jambi, "he said. The price at the level of farmers is now again good so as to trigger a group of farmers to add to the widespread added planting. The current price at farm level for red curly peppers is Rp 20 to 21 thousand per kg. "Our group is ready to supply and secure the Greater Jakarta area before the fasting and Eid Idul Fitri 1439H," said Sukarman.